Machinery WordPress themes enable you to display your machines on an optimal online platform. There is a great demand for machines and their respective spare parts, tools & equipment in the global market. All the different parts of a machine work together to produce a productive output. So, machinery themes basically give you a web space to showcase and sell your machines. This, in turn, leads to the creation of an e-hub for your tools and machinery. The machinery WordPress themes have numerous peculiarities to built a minimal upshot of a website. In these themes, you’ll get various features like WooCommerce integration, payment gateways, SEO optimization and more. Here we present 5+ machinery WordPress themes 2019 (Free and Paid), custom-made for multiple machine businesses. 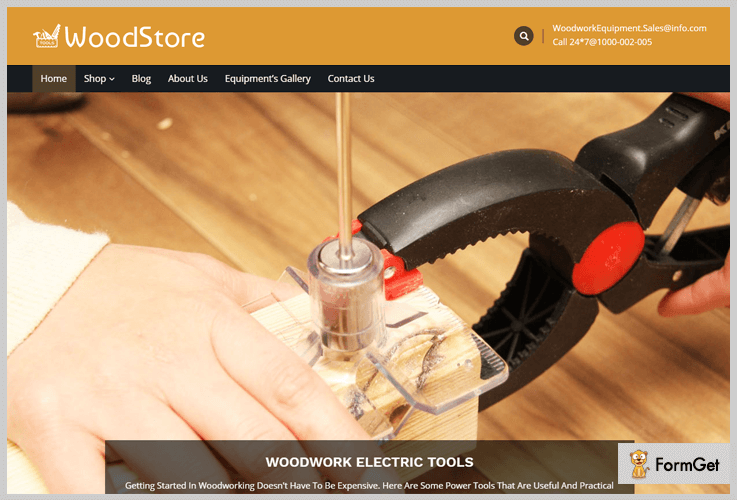 WoodStore is a woodwork machinery and equipment sales WordPress theme. Woodworkers such as manufacturers, repair & maintenance companies, machinery & artists, stores can make an efficient use of this theme. Now you can easily expand your woodwork business online with an E-commerce theme & cover bulk-audience. Supplementary features of this addon will let you integrate a WooCommerce plugin to facilitate payment gateway, return policies, gift cards, vouchers on your site. The WoodStore business machinery WordPress theme has a developer license of $79 with 24*7 support and regular product updates. This theme is compatible the latest version of WordPress. Display your product in the full-width slider section of this template. Unlimited color options and 6 different blog layouts are available with banner space in each layout. You can use Instagram profile, social icons, gallery and many more widgets in any widget section. 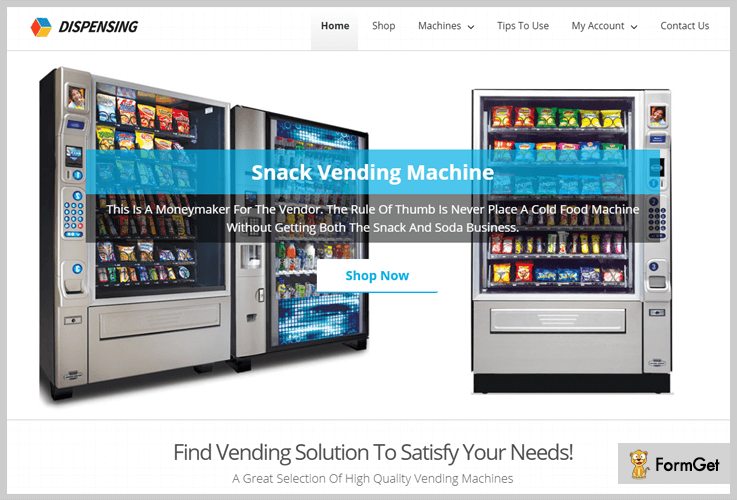 Dispensing is a WordPress theme designed for vending machines. The vending machine manufacturers, providers, exporters, suppliers, retailers, and wholesalers can have the special advantages of this theme. If you have a vending machine store, then present it online and boost your business. This theme is ready made for your site. Plus it is WooCommerce compatible i.e, you can sell your machines via payment gateway online in a completely automated manner. The Dispensing vending machinery WordPress themes will cost you $79 for a developer license. Full-width slider with text and description to showcase varieties of your vending services. Accordion to display the list of your vending services. Create unlimited feature areas with flip display hover effect. Recent posts & video section on the homepage. Cutting Tool is a machinery WordPress theme dedicatedly designed to showcase distinct cutting tools. The cutting machine manufacturers, suppliers, companies selling cutting/trimming machines & wholesale dealers of cutting tools can broadcast their firm globally. Display your cutting, laser cutting, trimming and other cutting tools in a full-width slider. The slider has a transition effect and attachment link through which you can directly send your visitor to any page. 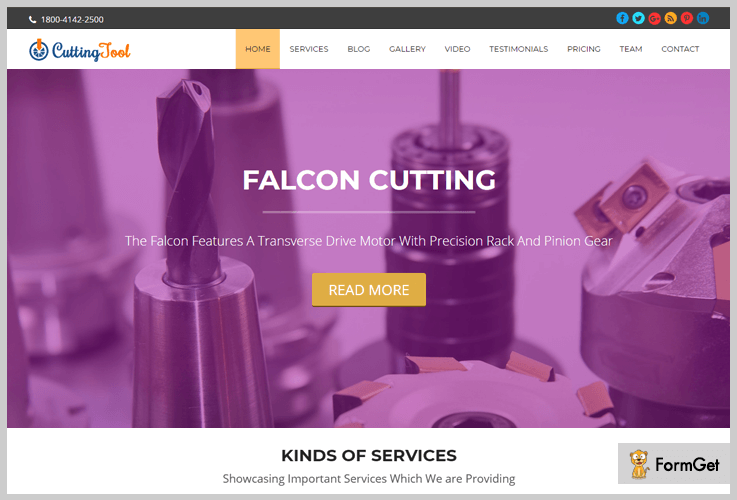 The Cutting Tool machinery WordPress theme has an affordable price of $79 with the ready-made functionality of a cutting/trimming tool template. A feature area with icons and caption to assist your visitors through your aid. This theme will provide a product pricing section. You can share numerous cutting/trimming tips via blog section of this theme. Elegant hive-style gallery with filtration options and you can also set a parallax background to this gallery section. 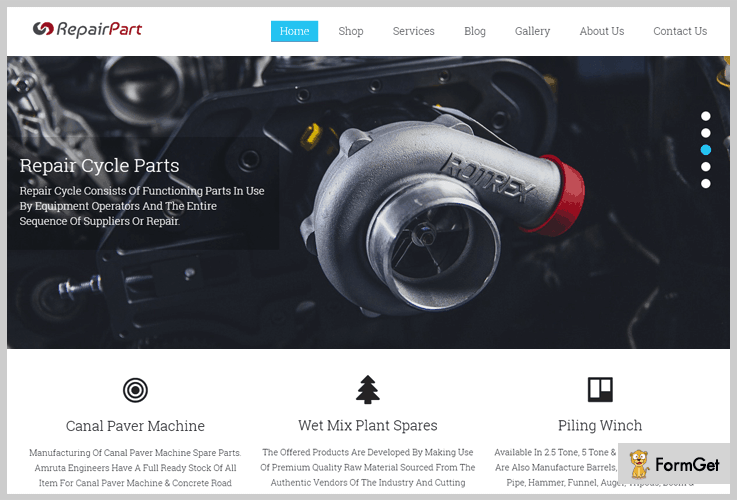 Repair Part is a machine spare parts sale WordPress template. It is specially crafted for industrial, factories, auto parts industries, auto parts sellers and similar sort of businesses. This theme has a portfolio gallery section to share your machines and equipment with your visitors. Furthermore, it has a block skin layout in which you can set a background image for the entire template. This spare part WordPress theme will cost a one time amount of $79 with custom templates available for multiple purposes & 30days money back guarantee. This theme has one-click installation and clear documentation. Layered slider which completely fit with the domain of your business theme. WooCommerce integrated with the theme of selling your products online. Exclusive product tagline area inbuilt. Themia Lite is a multipurpose machinery WordPress theme. It is a free product from InkThemes.com. Suitable for both the business and personal purpose. The clean and clear layout of this theme will let you easily customize the numerous theme options. Also, the theme will provide several custom made templates for blog pages and fullwidth page without sidebar. The Themia Lite machinery WordPress theme is a FREE product with amazing shadow effect. 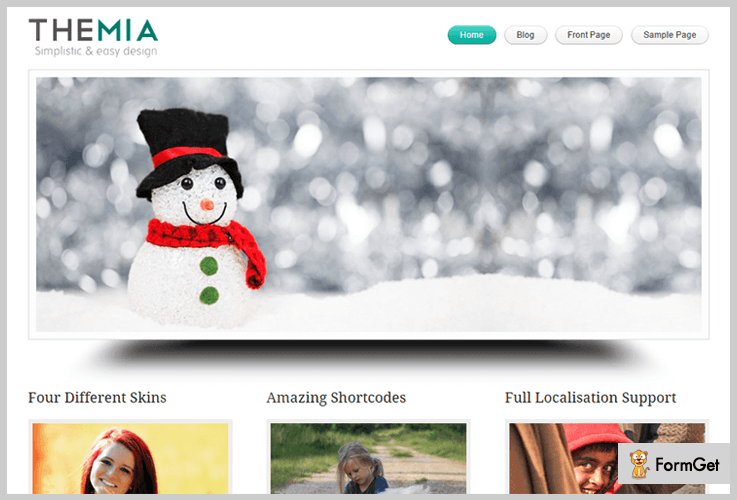 The Themia Lite is fully responsive and supports plugin integration. This theme has four different color skins. Easy-to-use and search engine optimized. 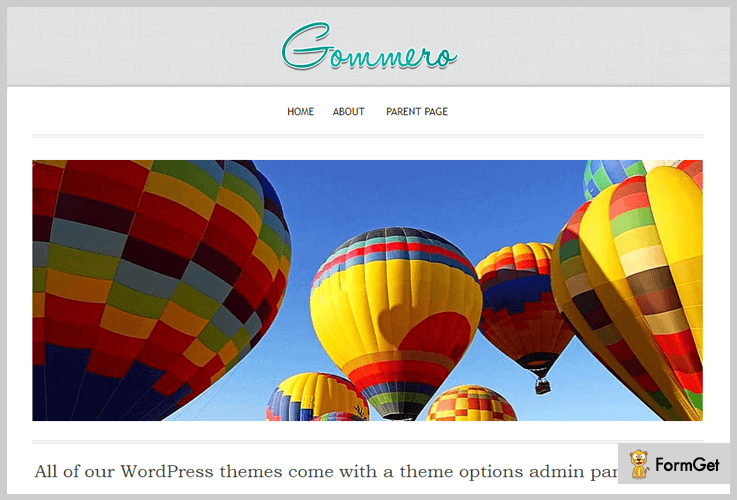 Gommero is a business/personal machinery WordPress theme. Easily choose your sites logo, text, and background with the use of this addon. It can build a website highly search engine optimized. This theme has an RTL support and it also supports microformats. The Gommero is Free machinery WordPress theme/template by InkThemes.com. The theme has a boxed layout and a background image can easily be customized. The navigation menu is available at the top of the template. A product tagline area along with a descriptive text. The homepage contains the recent blog page section. This article covers 5+ machinery WordPress themes 2019 (Free and Paid). These skins have many default behaviors and are designed for different machinery businesses. You can easily customize any of the above-mentioned layouts as your desire. We have also presented best industrial WordPress theme free download and most proficient machine themes. We hope the article covered your search interest. If you are having any doubts or interesting ideas to enrich the domain’s content. Do comment in the comment section below.